A slice of fiction with your pie? 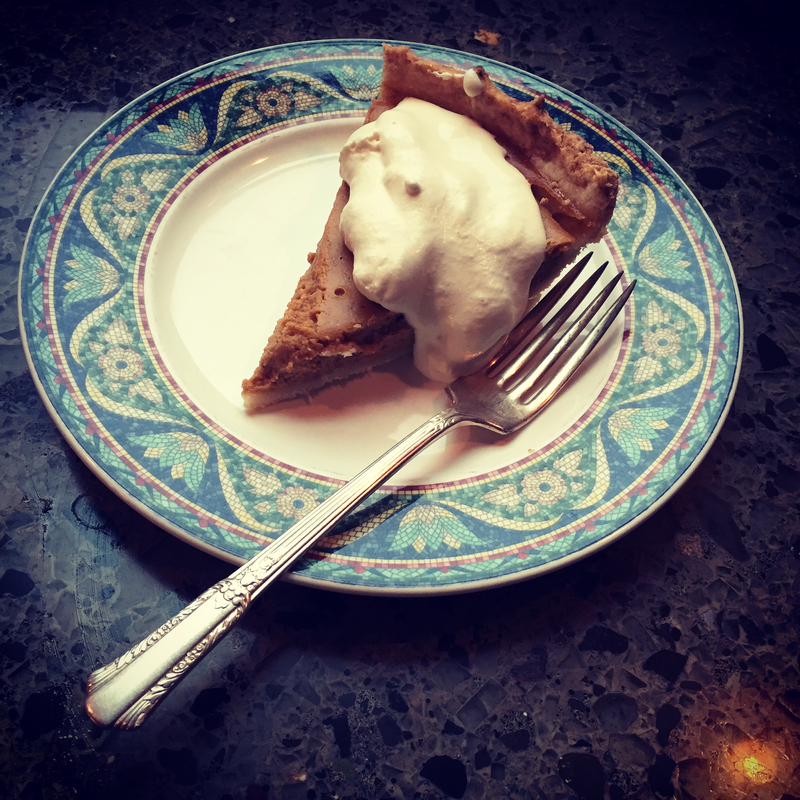 Today I give you my recipe for gluten-free pumpkin (sort-of) pie. But first, before you dive into the delight of the recipe, I want to whet your appetite with a crumb or two of fiction. A little tartlet of a story of a woman, and her pie. (If you really can’t wait because your guests will be here in three hours, here’s the recipe now). Katie narrowed her eyes, glaring at the offending pastry her brother had carelessly dropped on the counter on his way in. That wasn’t pie. That was…an insipid, greasy-crusted, overly-sweet concoction created by geeks in a lab. She spun around and followed Jimmie into the living room where he was giving Aunt Janice a kiss on her rouged cheek. “What the hell is that?” she asked, glowering at her lazy, older brother. Her mother leaned Grannie Jean forward and adjusted the pillow; the ancient woman leaned back with a sigh of pleasure. “Your welcome, Grannie.” Katie’s mother turned away from her grandmother and looked at Katie before jerking her head in the direction of the kitchen. Katie glanced at her brother. He was leaning back into the recliner, pushing to get the foot-rest to kick up. He looked like he couldn’t care less that she was pissed off by his contribution to Thanksgiving dinner. “Oh, that’s so sweet of you! That poor boy will be missing his own family, I’m sure. We’ll make him feel welcome.” Her mother patted Jimmie’s foot, and then, with another pointed glance at Katie, disappeared into the kitchen.